Surrounded by the musket fire of the American Revolution, Rachel Garnet prays for her family to be safe. When the British invade the Mohawk Valley, and her father and brother don't return from the battle, she goes in pursuit of them. She finds her brother alive but her father has been killed at the hand of the enemy. Amidst the death, how can she ignore a cry for help...? Rachel reluctantly takes in a badly wounded British officer. 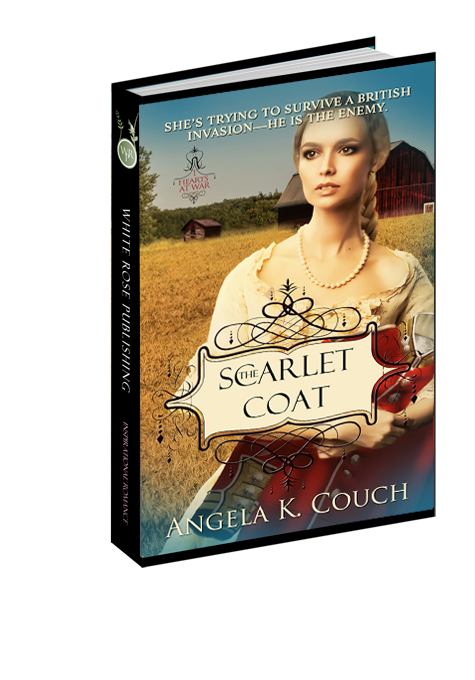 But how long can her sense of Christian duty repress her hatred for his scarlet coat? The last rays of sun faded into twilight, and the wind whispered through the trees, as if warning Rachel to turn back. She encouraged her pa’s stallion forward, though her pulse threatened to strangle her. Somewhere, not far away, a wolf wailed into the night. The mournful song resonated within her, bespeaking tragedy. She searched the deepening shadows of the forest. What if all the British hadn’t retreated? What if there were still Indians and Tories out there, waiting behind those trees? Something unseen rustled the leaves, and a twig snapped. Lord, what am I doing? How would she even find them out here in the dark? Maybe she should go home or to the Reids’ for another night. Her course of action seemed so clear when General Herkimer, and what remained of his regiment and the local militia, limped their way alongside the Mohawk River from Oriskany. The general lay on a stretcher, his leg below the knee wrapped in a crimson cloth, his face pale and expressionless—like so many of the men with him. Eight hundred had marched north the day before yesterday and barely half returned. Her pa and brother were not among them. Stay with the Reids. That was all Pa had asked of her. Benjamin Reid’s bad leg compelled him to remain behind and watch over their farms. Though the safest place for her, Rachel could no longer wait there trying to carry on a casual conversation with any of the Reid girls or hide behind her mother’s Bible. She couldn’t abide the confines of their snug cabin a minute longer without knowing her own family’s fate. Since losing Mama to illness two years ago, Pa and Joseph were all she had. She couldn’t lose them, too. But she’d ridden for hours now. Where was she? A little farther along the trail, the wind shifted slightly, carrying on it the odor of burnt powder and blood. Battle. Rachel’s hand came to her stomach in an attempt to calm the sickness churning within. The horse whinnied, shifting as he tossed his head. “Whoa. Easy, Hunter.” She slid to the ground and surveyed her surroundings. Both sides of the road were heavily treed and thick with underbrush. Even still, she could make out the dark forms of fallen men. She stumbled over her feet but kept moving. “Joseph! Pa!” You can’t be dead. Dragging the horse, Rachel ran. Each step constricted her throat until she could hardly breathe. Bodies littered the road—Indian, Tory, and American alike. She maneuvered around them, searching faces in the faint glow of the remaining light. She should have brought a lantern. The road sloped downward into a deep ravine. Her feet faltered. Hundreds of men—a patchwork of blue and homespun. All motionless. All dead. If only she could close her eyes or turn away, but every muscle held her in place. The rasp of a voice jolted her from the trance. She yelped and spun toward the intruder. Joseph looked back, and Rachel followed his gaze into the blackness of the timbered ridge of the ravine. She pushed away and moved stiffly in that direction. Pa.
Rachel stared into the trees, aching to pull away once again. She took in a jagged breath, managed a nod, and then surrendered to his firm hands. He assisted her into the saddle. Joseph retained the reins to lead the horse, but they didn’t make it more than a few steps before an unusual cry wafted in the breeze. The mewling of human suffering perforated the night. A yapping howl followed—a wolf answering the plea. “You stay here.” Joseph forced the thin leather reins into her hands, shooting her a warning glance before he hurried off the path and into the thick foliage. Ignoring his order, Rachel dropped to the ground, twisted the reins around a branch and ran after him. She wouldn’t be left alone again. Not in this place. Not in the gathering dark. As she caught up to him, she gripped his sleeve. Joseph’s mouth opened; then, he nodded his head. Turning away, he allowed her to trail him. Her fingers remained tangled in the fabric of his shirt. They followed the moaning to a tiny meadow strewn with more bodies. Rachel gaped at the shiny black patches of blood evident on almost every corpse and covered her nose and mouth against the stench saturating the air. As they drew near, the moans ceased. Joseph called out, but there was no reply. “He must be here somewhere.” Frustration edged his voice. Joseph moved out, stepping over the fallen, checking each for any sign of life. Rachel stood back, frozen. Motionless. Numb. The man’s whimpers, though now silent, resounded in her mind. What if he were still alive? What if he woke again to this dark and death, only to become as the corpses surrounding him, with no one to lend him life…to help him? Rachel forced her feet into action as she picked her way around a dead Indian. Though she tried to keep her eyes averted, they rebelliously wandered to the large hole in the middle of his chest. Her hand flew to her mouth as she lurched away. Stumbling backward, her feet tripped over a red uniformed body. She landed hard on the ground beside him. Bile rose in her throat and she twisted, retching into the nearest bush. “What happened?” Joseph rushed to her. She sat upright and wiped her mouth with the back of her sleeve. Her whole body shook. Joseph grabbed her arm and pulled her to her feet. “You shouldn’t have seen this. Let’s get you home. Whoever it was must already be gone.” He led her away, stepping over a fallen soldier’s body. Rachel shrieked as the hem of her dress snagged on something. She pivoted on her heel to where the soldier lay in his blood, his eyes wide, one hand extended. Rachel shivered. Joseph also reacted, bringing his pistol to the enemy’s position. The man coughed, and closed his eyes in pain. His brilliant scarlet coat and white breeches were smudged with grit and mud, his right hip a bloodied mass of flesh, probably ripped through by a musket ball. “Rachel, go to the road.” The pistol trembled in Joseph’s grip. “You’re going to kill him?” She glanced to the soldier. His eyes remained closed. His mouth moved slightly as though speaking to someone. Perhaps he was praying. She couldn’t do it. Rachel moved, but not in the direction required by her brother. Instead, she knelt beside the wounded soldier and laid a cautious hand against his cool forehead. His eyes fluttered open and peered up with evident fear. Confusion ridged his brow. Did he know he could expect no mercy and therefore could not understand her actions? His eyes rolled back, and his head slid from the large stone on which it had been resting. His body became limp with no sign of life other than the shallow, irregular breaths which moved his chest.